Welcome to our newsroom. For media inquiries, interviews, appearances or book signings and more, please contact us today. In this Association Maven’s episode, Josh Studzinski interviews Susan Marshall on how confidence plays a critical role in our jobs. We go through the definition of confidence, how to develop confidence, and ways to change your frame of mind. 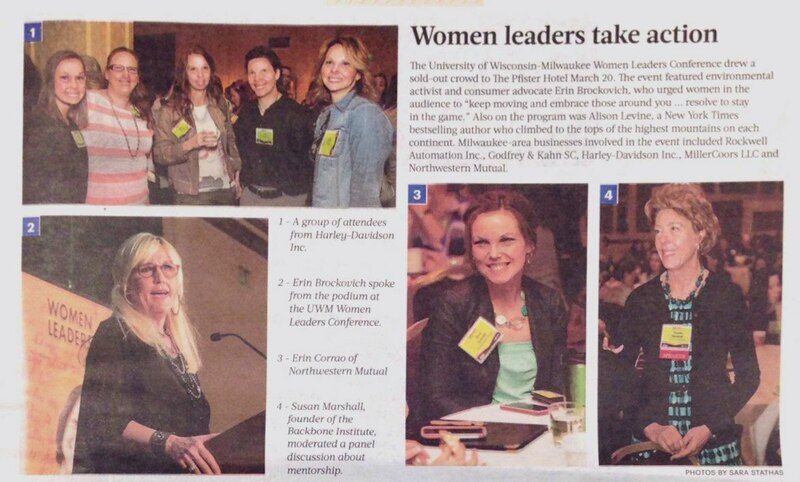 The University of Wisconsin-Milwaukee Women Leaders Conference drew a sold-out crowd to the Pfister Hotel March 20. The event featured environmental activists and consumer advocate Erin Brockovich, who urged women in the audience to “keep moving and embrace those around you… resolve to stay in the game.” Susan Marshall founder of the Backbone Institute moderated a panel discussion about mentorship. Ideas and beliefs about leadership have changed over generations as we have learned more about human behavior and how leadership impacts business success. It used to be that only men thought about becoming leaders, and only men of distinguished birth at that. The Great Man theory, developed in the 1840s, was based on the belief that leaders were born, not made. On the heels of presenting the Waukesha County Business Alliance Top 10 Businesses of the Year Awards, I want to share with our readers this week some pearls of wisdom from columnists, authors and consultants Susan Marshall and Susan Wehrley. Think of them as the BizTimes Lake Country Susans. Marshall is based in Oconomowoc. Her new book is titled, “Life. Be In It.” For nearly 30 years (though you certainly would not have guessed it by her lovely, youthful appearance), Marshall has been encouraging readers and live audiences to take a clear-eyed look at life, find the opportunities it holds and position themselves to pursue their dreams. No matter what you think about your company, it conducts plenty of useless meetings, miscommunication costs it dearly every year and high potential employees are being bullied. I could go on. It is said that, when the CEO of General Electric asks for coffee, one of his vice presidents will inevitably get him Brazil. Why? What does this mean?